Mathematics is an ocean in which a child can paddle and an elephant can swim. Or a whale, indeed. This book, a sequel to Wells’ excellent Penguin Dictionary of Curious and Interesting Mathematics, is suitable for both paddlers and plungers. Plumbers, even, because you can dive into some very deep mathematics here. Far too deep for me, I have to admit, but I can wade a little way into the shallows and enjoy looking further out at what I don’t understand, because the advantage of geometry over number theory is that it can appeal to the eye even when it baffles the brain. If this book is more expensive than its prequel, that’s because it needs to be. It’s a paperback, but a large one, to accommodate the illustrations. Fortunately, plenty of them appeal to the eye without baffling the brain, like the absurdly simple yet mindstretching Koch snowflake. Take a triangle and divide each side into thirds. Erect another triangle on each middle third. Take each new line of the shape and do the same: divide into thirds, erect another triangle on the middle third. Then repeat. And repeat. For ever. The result is a shape with a finite area enclosed by an infinite perimeter, and it is in fact a very early example of a fractal. Early in this case means it was invented in 1907, but many of the other beautiful shapes and theorems in this book stretch back much further: through Étienne Pascal and his oddly organic limaçon (which looks like a kidney) to the ancient Greeks and beyond. Some, on the other hand, are very modern, and this book was out-of-date on the day it was printed. Despite the thousands of years devoted by mathematicians to shapes and the relationship between them, new discoveries are being made all the time. Knots have probably been tied by human beings for as long as human beings have existed, but we’ve only now started to classify them properly and even find new uses for them in biology and physics. Which is not to say knots are not included here, because they are. 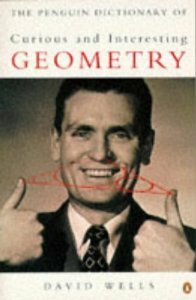 But even the older geometry Wells looks at would be enough to keep amateur and recreational mathematicians happy for years, proving, re-creating, and generalizing as they work their way through variations on all manner of trigonomic, topological, and tessellatory themes. “Man is the dream of a shadow.” — Pindar (518-438 BC).